"Beautiful product with immediate adhesion, but whose listening pleasure may quickly fade." Feverily watched since "Circus Pandemonium" released in 2014, the arrival of A.C.T. 's new album finally relieves aficionados. It is true that the Swedes are not very prolific with only six releases in fifteen years of existence, keeping a remarkably stable line-up since 2004. The quintet's formula is well known: a technically irreproachable dynamic rock base with rather cheerful accents. 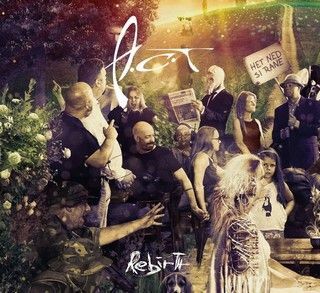 "Rebirth" does not deviate from this trace; the 5 tracks (yes, the opus is only an EP) keep a dynamic and choral base that does not encourage melancholy, and the opening track is the best example: with its odd rhythm and its immediately accessible chorus, "The Ruler of the World" gives a joy to play together extremely communicative. The subject is not fundamentally progressive, as throughout the EP, because the brevity of the tracks (5:10 max) does not allow convoluted developments, but the whole shows a formidable efficiency. On the other hand, "Rebirth" belies the assertion that "the only thing predictable with A.C.T. is that their music is unpredictable" (quote from the official website). The group recycles the recipes it has used up to now, with a sympathetic character of its own, but without adding any new stone to its structure. In form, it is not the few more or less vocoded electro sounds of 'A Broken Trust' and 'Digital Affair' that sound most original, and the instrumentals are far too short:'Meet the Past' is of a powerful efficiency, but remains very anchored in what the Swedes have already delivered to us, and far from the surprising madness of the first records.